Grapevine Craft Brewery has been pumping out pretty good beers for the past few years. 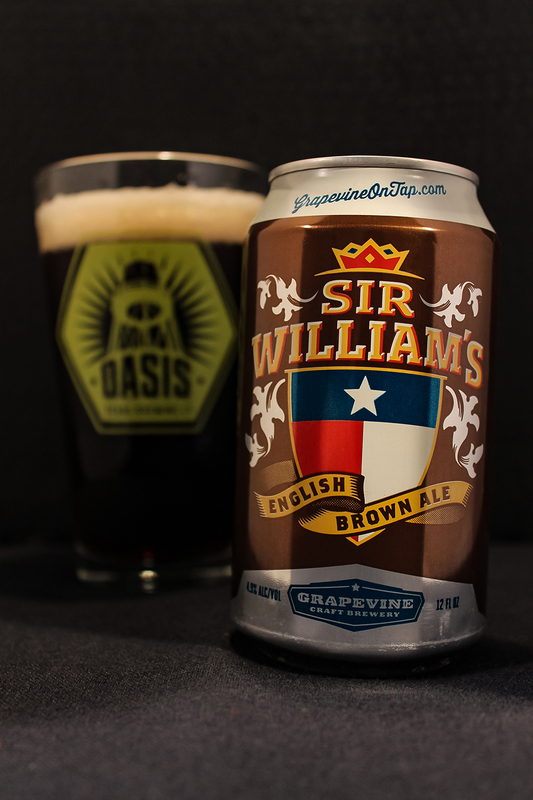 They are named after the city which the brewery resides, Grapevine, TX, which is located just north of Dallas/Fort Worth.These guys have been winning awards, including Gold in 2014 at GABF for this featured beer, Sir William’s English Brown Ale. Their beers were available in cans, and on draft in San Antonio, and among other cities until recently when Grapevine Craft Brewery decided to only have their beers exclusively available at their taproom at the brewery. This news sparked up a lot of rumors about the brewery preparing to close down. I will not be adding to this rumor mill, as I will say that they are still alive and kicking, pumping out their Craft Beer available to the good people of Grapevine, TX and those that travel there. It will be sad to not see them on shelves here locally though. For this session I used a pint glass from Oasis Texas Brewing Company from Austin. Sir William’s poured a clear mahogany brown color that was topped with 1.5 inch light khaki colored head. The head retained as a thin layer leaving web-like lacing. The aroma was really strong caramel, mild chocolate, some roasted malts, a nutty character, a little trace of milk, musty, earthy hop profile, dark bread. Lingering caramel, and earthiness. The taste was similar to the nose with strong up front caramel, blended with some chocolate notes, good flavor of roasted malts, a trace of a nutty character, some sweet milk, musty, earthy hop profile, and rounded out with a dark bread flavor. The aftertaste, for me, was a mix of sweet milk, strong caramel, and earthiness. The body is a slight lighter than medium. Good carbonation, mouthfeel is slick, oily with a tiny crisp bite. Sir WIlliam’s finished dry. Overall, I will have to say that there is no doubt in my mind why this beer has son a lot of awards. It had an excellent blend of flavors in the aroma and taste. I do wish that the body was a bit heavier to perfectly match the big flavors of this beer. I am going to really miss finding this beer locally once the last shipment depletes. It’s not everyday that I could just go drive to Grapevine, TX, which is about a 4-5 hour drive from where I live. Ah well, I’m sure they have their reasons for their change. I just hope the rumors aren’t true. It will be sad to them completely disappear. For now, I will one day the brewery to get my hands on some more of this good stuff. Metal Connection: OK, so this one is a weird twist. I really didn’t think I would find a song that would pair with this beer’s name, but luckily I ran across a song by the German Heavy/Power Metal band, Grave Digger called William Wallace (Braveheart). So, of course this person is best known as Sir William Wallace, who was a Scottish knight who was a leader during the Wars of Scottish Independence. Here’s the twist; Sir WIlliam Wallace led the Scottish against the English during this war. Well, we have an English Brown Ale here, so why the hell not. All the characters are there in this Metal Connection, just on opposite sides. 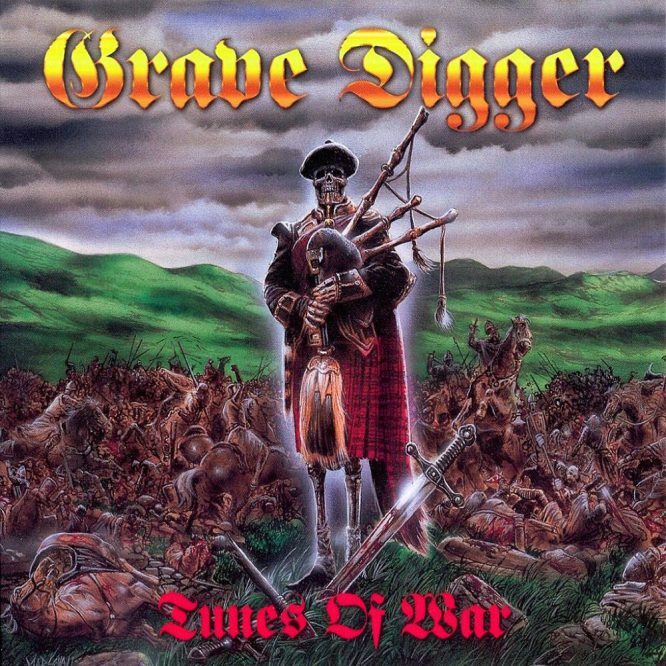 Instead of posting the studio version of this song, I found a great live performance of this song from when Grave Digger played at the Wacken Open Air festival in 2010.